Our most advanced contoured keyboard yet...Compatible with PC & Mac operating systems, instantly configure the layout for Windows, Mac and non-Windows operating environments as well as advanced programming features. Automatically switch between PC and Mac operating systems. Embedded 10-key to reduce over reaching for the mouse. Integrated two-port 1.1 USB hub. NOTE: Only compatible with low-powered devices, specifically mice and numeric keypads without a usb hub. Double memory for longer macros (24 macros yields 142 characters, 36 macros yields 94, and 48 macros yields 70). Memory locking switch protects users or managers against accidental or unauthorized programming of the keyboard..
Warranty: Two Year Limited Manufacturer's Warranty. Based on two years of research the Kinesis contoured keyboard was designed not only to reduce the known risk factors associated with repetitive stress injuries but also to provide a more comfortable platform than other keyboards. Its unique contoured design reduces the force and stressful postures that contribute to discomfort and limit productivity. 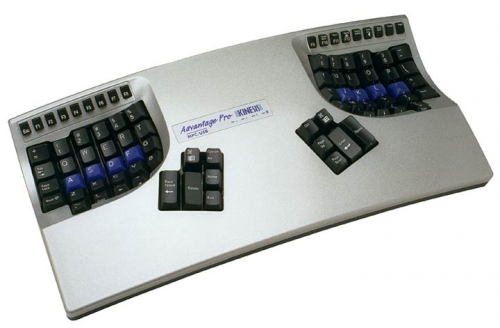 Since its introduction in 1992, the Kinesis keyboard has undergone extensive independent testing and has proven superior in both comfort and productivity against traditional and other alternative keyboards. Separate thumb keypads - the thumb keypad includes often used keys such as "Enter", "Space", "Backspace", "Delete" and the combination keys, "Control" and "Alt" on the PC ("Command" and "Option" on the Macintosh). This redistributes the workload from your relatively weaker and overused little fingers to stronger thumbs. Separate key wells for each hand - Separate key wells for each hand - this separation minimizes strain and stretching by positioning your arms approximately at shoulder width and with wrists straight. This design reduces abduction and ulnar deviation (common symptoms experienced with repetitive strain injuries such as carpal tunnel syndrome and tendonitis). Concave Key Wells - reduces hand and finger extension. Extension occurs when the joints in your fingers curl up and extend forward from your hands rather than relaxing down slightly in the direction of the palms. A flat typing surface assumes that your fingers are all of the same length, thus your longer fingers must arch up over the keys. The result is extension of the muscles and tendons in your hands. Your muscles do not operate at maximum efficiency and the result is more rapid muscle fatigue. Concave key wells reduce extension by accommodating the various lengths of your fingers and placing your hands and fingers in a more relaxed and neutral position. Vertical key layout - keys are arranged in vertical columns to reflect natural motions of your fingers, and the keypads are sculpted and concave to fit the varying lengths of your fingers. Closer placement of function keys - soft-touch function keys are positioned closer to the alphanumeric keys to reduce awkward motions and stretches, particularly for key combinations involving thumb keys (Control and Alt, for example). 20-degree lateral tilt design - the keyboard design places your hands so that your thumbs are positioned approximately 20 degrees higher than pinky fingers. This design helps to minimize stresses associated with pronation and static muscle tension while enabling maximum keying productivity. Integral palm support - the palm support with optional self-adhesive pads enhances comfort and reduces stressful extension of your wrist. This provides a place to rest your hands while they are not actively keying. Low-force, tactile key switches - the low-force, mechanical key switches are engineered to provide both tactile and audible feedback. Their long travel (4 mm), with activation at approximately 2 mm and 45 grams of force, reduces the jarring impact of "hitting bottom". Embedded 10-key layout - a traditional numeric (10-key) keypad is embedded into the right alphanumeric keywell, which provides ergonomic advantages for number-intensive operations. The 10-key legends are located on the front edge of the key caps. The 10-key can also be programmed to operate from the left keywell. Key re-mapping - individual keys can be re-mapped or copied to other key locations. As a result, you can customize the keyboard's operation for your personal use to reduce stressful reaches and establish an optimal hand workload. Macro programmable - up to 48 macros can be programmed and stored in the keyboards on-board memory. Great for eliminating awkward key combinations or for individuals that type the same word or phrase repeatedly. Optional foot switches - up to three foot switches can be used to perform keystrokes, redistributing a portion of the workload away from your hands. For instance, a foot switch can be used to activate the embedded 10-key pad or "shift" key. Smaller footprint - another benefit of the embedded 10-key is that reduces the overall width of the contoured keyboard measuring only 16 5/8" x 8 1/8" x 3" making it much smaller than a traditional keyboard. This smaller foot print allows closer placement of any pointing device reducing over-reach issues.